1. Pour the stock into a pan, add the ginger, star anise, red chillies and garlic, bring to a boil, reduce the heat and simmer for 10 minutes. 2. Remove the ginger, star anise, chillies and garlic, and discard. Add the turkey meat to the stock with the carrot and shredded Brussels and cook for 1-2 minutes. 3. Divide the noodles between 2 bowls, spoon over the hot flavoured stock, vegetables and turkey. 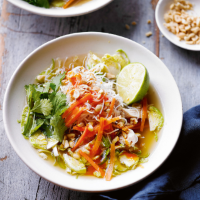 Top with a squeeze of lime, the chopped peanuts, coriander leaves and a little chilli sauce.